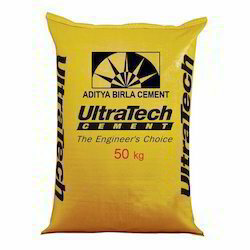 Prominent & Leading Wholesale Trader from Nagpur, we offer ultratech opc cement 43 grade, ultratech opc cement 53 grade, ultratech ppc cement and birla shakti cement. OPC (43 Grade) can be used in all kind of Concrete constructions – such as RCC, precast concrete and prestressed concrete, Slip form constructions, all kinds of Masonry works, manufacture of cement based products such as pipes, tiles, blocks etc. OPC 53Grade Cement is more suitable where high early strength is necessary viz. 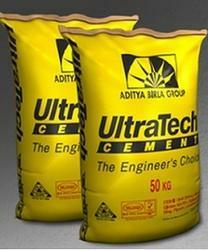 for production of High Strength/ High Performance Concretes and for Rehabilitation/ Retrofitting works. Blended Cements can be used for all general construction works, especially for works in aggressive environmental conditions particularly in coastal areas to counteract chloride and sulphate attacks, water retaining structures, marine works, sewage pipes, mass concrete works such as dams, etc., substructures in sulphatic soils and structures in hot and humid climate. Ordinary Portland cement (OPC) 53 Grade is used in RCC and pre-stressed concrete of higher grades, cement grouts, instant plugging mortars etc. where initial higher strength is the criteria. Low percentages of alkalies, chlorides, magnesia and free lime leads to the production of durable concrete. Portland Pozzolana cement is ordinary Portland cement intimately blended or interground with pozzolanic materials such as fly ash, calcined clay, rice husk ash etc. 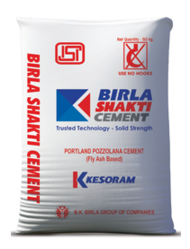 Portland cement clinker is either interground or intimately blended with specified quantities of gypsum and pozzolanic materials to produce Portland Pozzolana cement. Pozzolanas by themselves do not have cementitious properties but reacts with calcium hydroxide in the presence of moisture at normal temperature to form compounds having cementitious properties. The concrete produced by using Portland Pozzolana cement has high ultimate strength, is more durable, resists wet cracking, thermal cracking and has a high degree of cohesion and workability in concrete and mortar. Portland Pozzolana Cement (PPC) makes concrete more impermeable, denser as compared to OPC. The long-term strength of PPC is higher compared to OPC. PPC produces less heat of hydration and offers greater resistance to the attack of aggressive waters than normal OPC. PPC can be used for all types of construction. Blended with high grade Pozzolana. Most recommended for all modern constructions. High long term strength & durability. Smooth finish, resists seepage & cracks.